I just finished up this fabulous collaboration with Eina of Einamade & Rebekah of ArtRebCo and I am so excited to share. I’ve always loved pottery and have entertained the idea of pottery classes just to try out surface design with stamps. But alas! Since I can’t do it all, I reached out to the real professionals to test out underglaze ink pads and answer some questions for us. 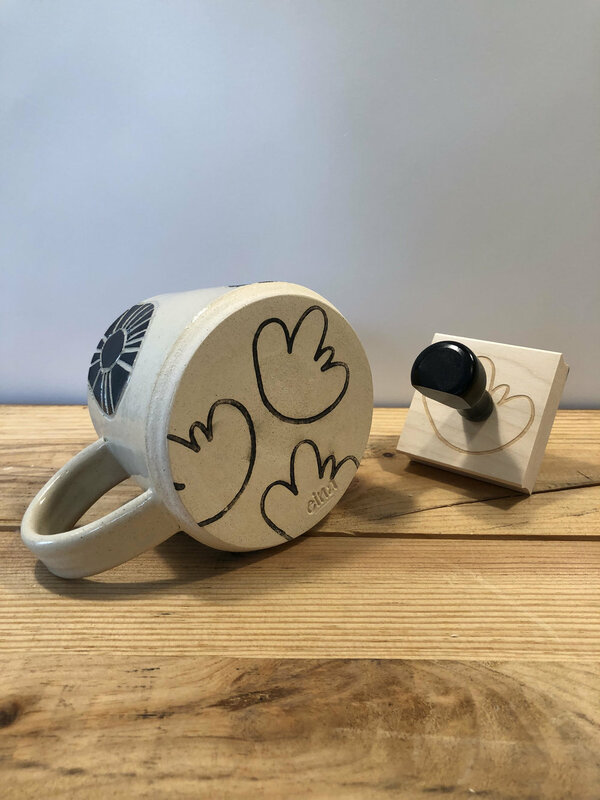 These talented ceramists tested out some Creatiate custom rubber stamps with Potter’s Pads, and check out what they made……..
I’ve also had the privilege of supplying stamps to Paper & Clay! How gorgeous is this!? Create a bee-inspired repeat pattern from hexagon stamps. Create simple Christmas Ornaments with a circle cookie cutter and this Christmas Stamp. Wedding favor tags for your wedding guests with your very own custom wedding logo on them. A “Handmade By Me” ceramic tag to put on a special product would make it crazy giftable and really professional. A custom stamp of your signature or logo, for the bottom of your pieces sure makes them professional. Want even more inspiration? I’ve got a whole pinterest board full.